We are excited to announce the availability of Steelray Project Analyzer 2018.5, a major release of Analyzer! This is the biggest release of Analyzer in many years. Analyzer 2018.5 includes support for all of the latest schedule metrics that DCMA is using on their EVAS schedule assessments. 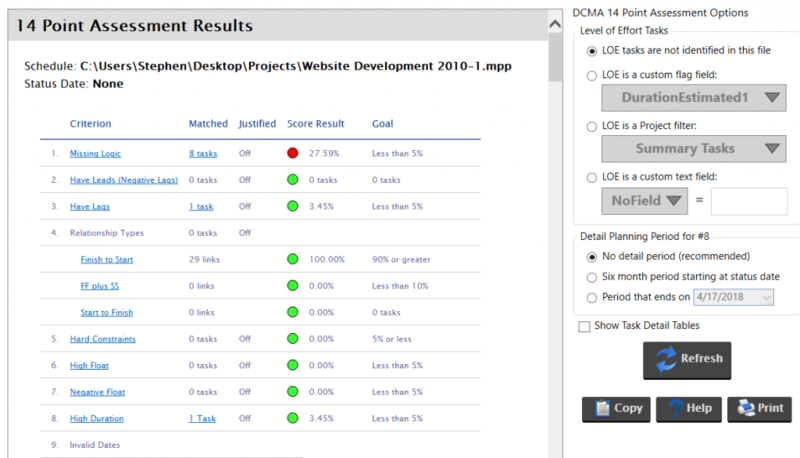 Analyzer’s DCMA 14 Point Assessment is enhanced as well. With the 2018.5 release, all 14 tests are executed without changing the source schedules, including schedules with master and subproject files. As always, we include two versions of the report: one which runs strictly according to DCMA guidelines and one that can be customized and configured to suit your needs. The custom report is renamed to “Configurable DCMA Assessment” in this version. With Microsoft Project files, when you click the Analyze button, the longest part of the processing is extracting the necessary data from Project. When the extraction takes a while, the whole analysis takes a while. There are generally two technologies used for this, and both come with technical baggage (i.e. compromises): accuracy and speed. We’ve written a new project data extractor optimized for blazing speed with perfect accuracy, giving you the best of both worlds, and Analyzer is our first product to use this technology. The extractor is called Steelray Project Add-In and (as the name implies) it installs as a very lightweight add-In to Microsoft Project. Once installed, Steelray Project Analyzer connects to the add-in to grab the data it needs, in less time than ever before. But that’s not all it does. Because Analyzer and the Project Add-In can talk to each other, we’re better able to detect when something goes wrong with Project. This allows us to better communicate and handle the issue. Future products that Steelray will build may use Steelray Project Add-In as well, reducing their installation footprint. In 2018.5, we addressed dozens of usability items to make for a better user experience. In previous versions, some reports would have a sidebar which would allow you to change settings related to the project or the report. You could only access those settings after running the report, which was clunky. We’ve moved those settings out of the report to where they belong: project settings and report settings. The old DCMA 14 Point Assessment, with settings to the right. The new DCMA 14 Point Assessment. Settings have been moved. There’s a stark difference between the old and new project settings. 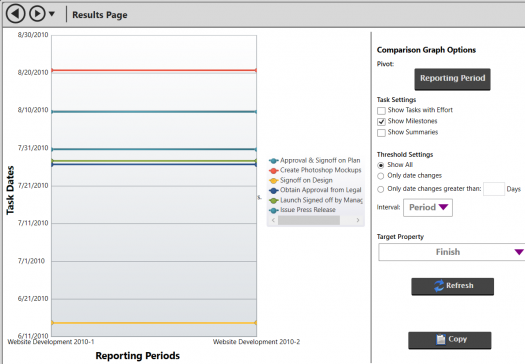 With the new settings, you make changes in one place and the changes apply wherever used in a report. 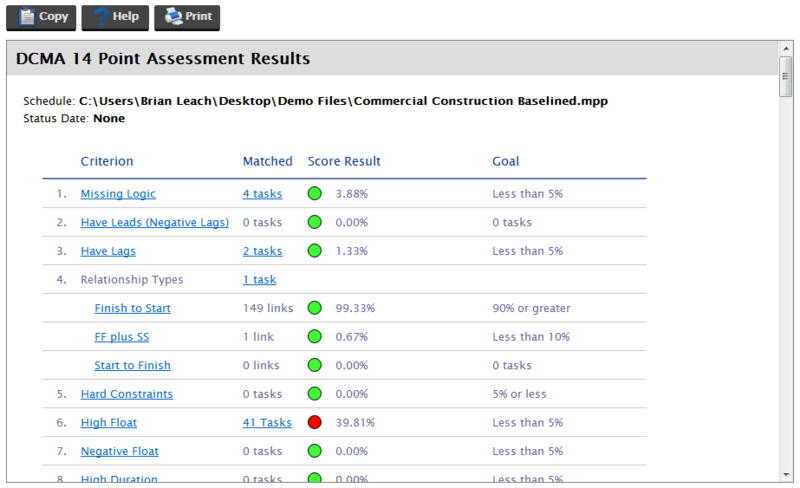 For Microsoft Project files, there is a new link which allows you to open the project file directly from Analyzer. The old project settings screen. 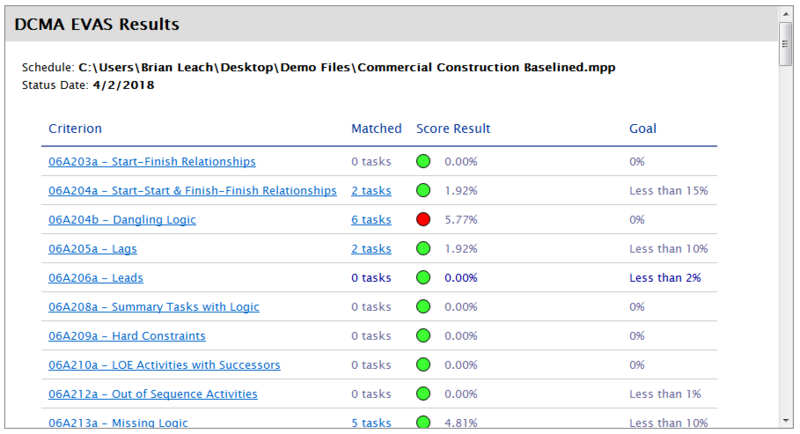 In the new project settings, you’re able to change settings for this project across all reports. Similarly, we’ve taken settings out of the output of some reports and added them to our enhanced report settings. 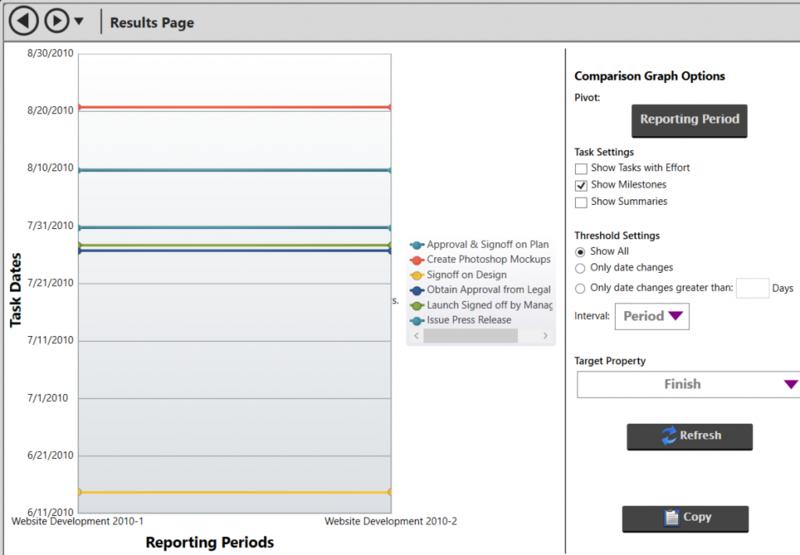 This is an example of the old Schedule Compare Graph report. The settings are included in the output. In the new version, the report settings are where they belong — in Report Settings. The first generation of Analyzer had a feature where you could edit any criteria on a scorecard with one click; a great shortcut that we missed when it went away in the next version. You can edit criteria in the scorecard with one click. We’ve greatly enhanced project sets in Analyzer 2018.5 with a new feature called snapshot sets. Before, to select two or more schedules for a comparison report, you had to load and select them individually. You may have had 12 schedules, one for each reporting period, cluttering up your Projects list. In 2018.5, a project set has a checkbox setting that tells Analyzer that the list of projects in the set are snapshots of the same schedule — a snapshot set. 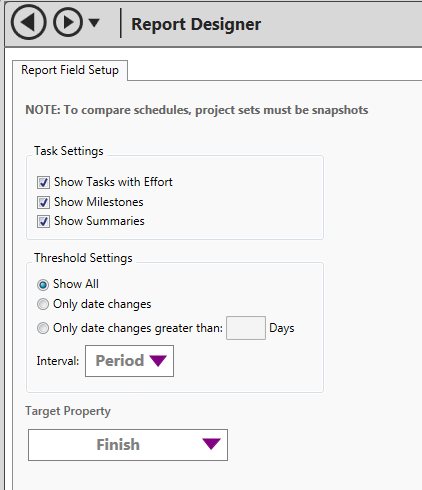 For reports like Schedule Comparison that required you to select all of the projects to be compared, the process is much easier, Select the snapshot set and you’re good. Creating snapshot sets is easy! We’ve added features to make it much easier to diagnose connection problems with Microsoft Project Server, Project Online, and Oracle Primavera P6. For P6, we check to make sure the necessary permissions are correct after the connection. Cursive handwriting is an important and valuable skill that should be learned by all children at an early age. So, cursive is taught early and heavily promoted over manuscript (the simple, unconnected method we learn first). But, according to research, there is no real benefit to cursive. On the contrary, manuscript may be?superior in most respects. And, in today’s device-driven world where almost nothing is written by hand,?we hardly even read anything in cursive. It seems like the notion to continue using it is, well, dumb ? a classic case of tradition trumping evidence. Performance programs are thought to boost morale and incentivize employees, but they often benefit only a few while disenfranchising those who don?t make it to the top. Ongoing checkins, properly done, can be much more effective at giving employees?and management?the insight they need to be more effective at their jobs day-to-day. 3. ?No meetings? policies, because meetings are boring and unproductive. Meetings are critical for strategic planning and communication, so perhaps the solution is not to ditch them, but to learn how to have better meetings. Conversely, not all meetings are created equal. Are you swamped with ?status? meetings that are better served by reports and emails? Is the meeting actually serving a goal? 4. Corporate communication and knowledge sharing via an intranet. Do people use it? Does it integrate into daily workflow? Intranets are hard to do. Research shows that the interview process is laden with personal, subconscious bias. Many interviews are highly unstructured and ineffective. Employee feedback initiatives easily fail, unless they’re ongoing, driven from the top, and result in tangible responses by management. According to Richard Branson, putting your employees first results in the best customer experience possible (which, in a way, actually puts your customers first). Recently a recruiter reached out to me about a three-month Scrum Master role. Was I interested? No, I love my job at Steelray. Did I know of anybody? Well, maybe, but…three months? The team doesn?t understand team skills and doesn?t recognize the deficit. They don’t understand team skills, but know they need them and want to do something about it. The team is actively acquiring skills, but it takes a lot of attention and intention to apply them. It?s been my experience that most teams are Stage Two, some are Stage Three, many (too many) are Stage One, and a rare few make it to Stage Four. 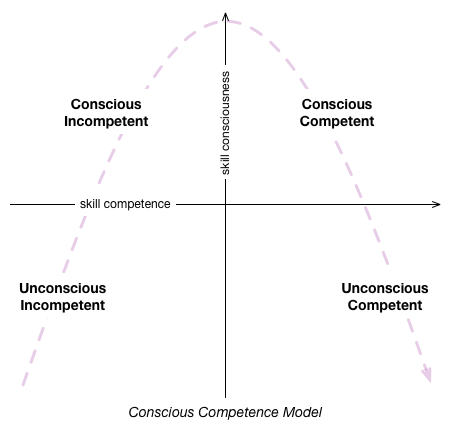 Considering the huge benefits of great teamwork, it’s worth taking stock to and looking at your own competencies. Where are you on the model? Not just your developers, but sales, marketing and operations? Even senior management? To what degree is everyone on the same page with the work? To what degree is everyone on the same page with how they work together? You may find there?s room for improvement. Even if you?re at stage four, it?s worth being intentional and devoting ongoing time and energy.